JIMMA, Ethiopia – After her wedding at age 20 in the Seka District of Ethiopia, Birkisa Aba Nega became pregnant. Then again, and again. Four of the five children she delivered died, and she was left with a debilitating childbirth injury – an obstetric fistula. Pregnancy can be a dangerous time, and for women with ill health, malnutrition or underage pregnancy, the risks are even higher. One of the most serious complications a woman can experience in childbirth is prolonged, obstructed labour. Women who survive this condition can develop an obstetric fistula, a hole in the birth canal that leads to chronic medical problems, including pain and infection, as well as incontinence. This misfortune is often compounded. Women who develop obstetric fistula typically also deliver a stillborn baby. And the stigma of chronic incontinence can cause women to be isolated, even shunned. Obstetric fistula affects the most vulnerable, marginalized women – those without access to quality obstetric care. Ms. Aba Nega was one of those women. She never received antenatal services, and she delivered at home, without skilled care, for her first four pregnancies. During her last pregnancy, she was in labour for a day and a night before an ambulance was summoned. She was taken to a health centre then transferred to a hospital, but it was too late. She lost the baby. 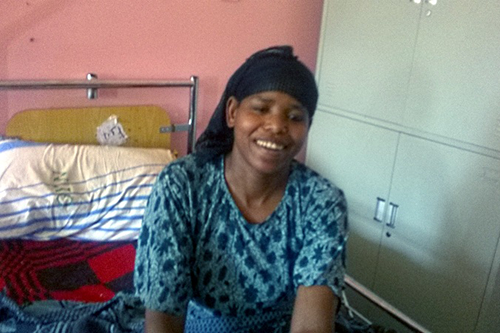 By the time she had returned home, she began to show signs of developing an obstetric fistula. As the condition worsened, Ms. Aba Nega’s husband began to avoid her. She stayed home, isolated from her community, for more than a year. 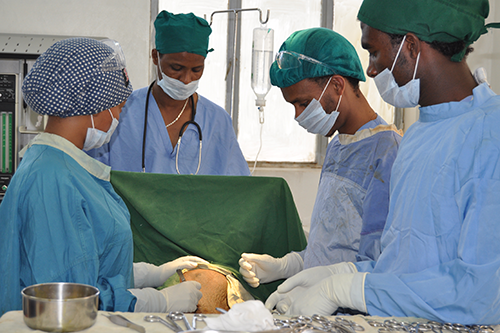 Surgical teams have been trained through with UNFPA support. These circumstances are all too common. According to a 2016 national survey, only 62 per cent of women in Ethiopia receive antenatal care, and only 28 per cent of births are attended by a skilled health provider at a health facility. 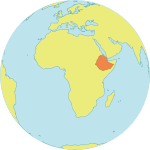 A 2013 study by USAID estimated that 36,000 to 39,000 women in Ethiopia are living with obstetric fistula, and that 3,300 to 3,750 new cases occur every year. Three years ago, the Government of Ethiopia launched a campaign to eliminate obstetric fistula by 2020. UNFPA is supporting this effort by helping to identify fistula survivors and supporting surgical repairs at hospitals in Assela, Gondar and Jimma. UNFPA’s contribution includes training mid-level health professionals and community health workers on the prevention and diagnosis of fistula, and supplying equipment to facilitate prevention and repair efforts. In the year after she developed the fistula, Ms. Aba Nega’s husband consulted many traditional healers, to no avail. Finally, he took her to a local health centre, which referred her to Jimma University Medical Centre. At Jimma University, training in obstetric fistula care has been integrated into the teaching programme. Mid-level health professionals also learn to address fistula – and related conditions, such as uterine prolapse – through an in-service training programme. Slowly, progress is being made. Local-level health workers now identify fistula survivors and refer them to UNFPA-supported fistula repair centres. In addition, Healing Hands of Joy, a partner in the UNFPA-led Campaign to End Fistula, is training survivors like Ms. Aba Nega to raise awareness of fistula prevention and treatment in their communities. These efforts are paying off. More and more fistula patients are seeking help. As for Ms. Aba Nega, she has received a surgical repair and is looking forward to helping other women do the same.